This powerful enterprise class software delivers your GPS vehicle tracking and function data every five seconds – 24 times faster than the industry average of two minute refresh rates. Evaluated, tested and endorsed by leaders from government, private enterprise, trucking/delivery companies and emergency responders, you can implement this system with confidence that it has been proven to work flawlessly in the most demanding GPS fleet tracking operations. 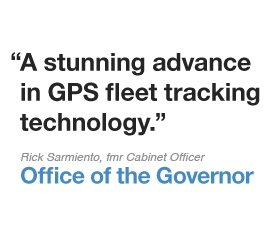 The GPS Logic system was meticulously engineered to give your fleet managers real time Actionable Information — information that allows them to instantly deploy, route, monitor and manage your vehicle and employee assets for maximum utilization and productivity, whether your fleet is 10 or 10,000 vehicles. Share one device and one wireless plan for vehicle tracking, ePCR, mobile data, mapping and telemetry with integrated WiFi, ethernet and GPS. Remotely lock & unlock any vehicle in your fleet from anywhere in the world. Have your vehicle automatically start itself when the batteries are running low. Or, receive a text message or e-mail when a vehicle corners or brakes too hard — all with simple sensors and connections to the Logic 5000’s multipurpose I/O connector. Use the integrated GPS receiver to stream location information to your tablet PC or mobile computer for in-cab navigation while simultaneously reporting AVL to your dispatch center for up-to-second tracking accuracy. Unlike comparable products, the Logic 5000 3G may be powered continuously (even with the vehicle off) for uninterrupted network and AVL connectivity. With the integrated voltage monitoring feature, the Vanguard will power itself off when the vehicle battery drops below a set threshold, preventing drained batteries and stranded vehicles. The Logic 5000 3G is an ideal solution for large corporations or geographically diverse customers in need of remote management and configuration of deployed devices. Administrators can push out firmware and configuration changes without the need to access each vehicle. Experience the full power of remote vehicle control through the GPS Logic vehicle tracking system, or use the Logic 5000 3G with your existing AVL provider. Use the integrated ethernet port for sharing 3G/4G access with wired equipment such as docking stations, computers, and video systems. Wirelessly tether a Toughbook, iPAD, PDA, or other WiFi device for sharing of cellular data up to 300 feet from the vehicle. Or save on cellular costs with WiFi client mode for attaching to your own hotspots when in range of the selected networks. Wirelessly send field employees text messages and route guidance via the integrated Garmin interface. Automatically have your workforce routed around traffic congestion with the built-in live traffic service. 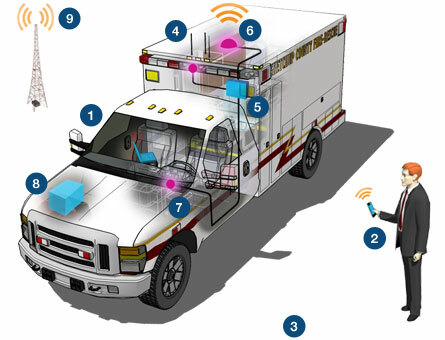 Using the optional Bluetooth access point, Fire and EMS agencies are able to wirelessly connect their cardiac monitor for transmission of ECG data to their servers or that of the receiving hospital. Remotely configure, troubleshoot, and upgrade the Logic-5000 from across the globe with remote device management. Real-time vehicle positions are transmitted at 5 second intervals for instant dispatch and routing. Historical data is saved indefinitely and available for immediate recall. Connect the multiple inputs and outputs for monitoring of various vehicle functions including Code-3 usage, panic alarms, G-Force events, or use of seatbelts. Sensors are available for almost any function including compartment access, temperature, acceleration, or even radioactivity. Securely and remotely trigger vehicle events such as remote starting, unlocking, and locking. The integrated battery management system enables the Logic 5000 to shut itself off prior to discharging the vehicle batteries, preventing stranded employees and damage to batteries and alternators. In conjunction with the GPS Logic Fleet Management System, the Logic-5000 can also send SMS and e-mail alerts when a vehicle is approaching a discharged state, allowing the operator to take action before the vehicle becomes unusable. With 4G on the cusp of widespread deployment, GPS Logic customers will have piece of mind in knowing that their equipment can be upgraded as technologies evolve. Whether it’s 4G tomorrow, or 5G two years from now, your investment will always be protected from obsolescence.